The final major manoeuvre of the rendezvous was braking. Since the TPI burn, the LM had been coasting on an intercept trajectory that was essentially part of an orbit. The apolune of that orbit was a kilometre or more higher than the altitude of the CSM and, without braking, the LM would have sailed by in front of its target. Starting from a distance of nearly 3 kilometres, the commander executed a series of manoeuvres to reduce the closing speed of the two spacecraft. Each was pre-planned to occur at ever narrowing ranges to the CSM, and although his checklists included suggested approach speeds, the commander used his piloting instincts to achieve the actual braking thrust at each. As explained by John Young, when talking about his approach on Apollo 16, there were wider issues that dictated the approach speed. If the LM thrusters stopped working, could the CSM finish the job? The LM was light and its thrusters were very effective, but not so the heavy CSM, which was still loaded with propellant for the burn home. ''It's a very light, dancing vehicle,'' agreed Armstrong. On completion of a successful rendezvous, it was normal for the two vehicles to spend some time station-keeping - that is, floating next to each other - in order to give each a chance to inspect the other. For example, on Apollo 15, Scott and Irwin were asked to look at the SIM bay in the side of Endeavour's service module. While Worden had been operating the cameras and instruments mounted in the bay, mission control had noticed that the output from a sensor was not as expected. It was designed to measure how rapidly the landscape below was passing, thereby letting the mechanics of the panoramic camera compensate for the image motion. Scott was being asked if he could see any obstruction in front of the sensor, which he could not. The problem lay in its optical design. On Apollo 16, as Orion lifted off the Moon in front of the rover's television camera, controllers noticed that the skin at the rear of the ascent stage, the part that faced the camera, appeared to have been disrupted at launch. This unpressurised part of the LM housed much of its electronic systems, including the electric control assemblies (ECAs), which were part of the spacecraft's electrical supply system. 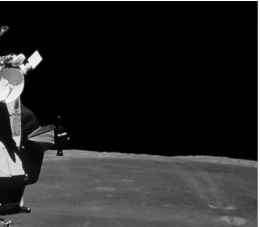 They asked Ken Mattingly in the CSM Casper to describe what he saw as Young made Orion perform a pirouette in front of his camera. Orion, Apollo 16's LM, with disrupted thermal blankets over its rear. "No, sir,'' replied Mattingly. "It's not possible from the back; I can't tell about the bottom; but, on the back side, the Mylar blankets are still intact - it's only that outer covering that's broken.'' Orion's damage did not prove to be a problem for the rest of its short life. The LM approached the CSM with its windows facing its quarry. When originally envisaged, the LM was to have had two docking ports, the second being at the forward hatch. 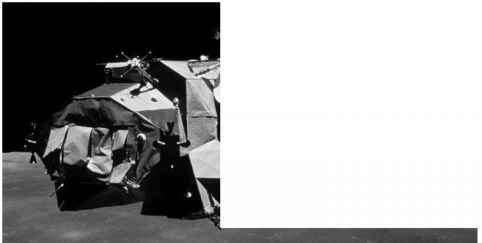 But in the drive to cut weight from the spacecraft, the heavy docking collar was dropped and replaced by a simple square hatch through which a suited crewman and his back pack could crawl on his way to the lunar surface. The remaining docking port was at the top of the ascent stage and there was a small window above the commander's head to enable him to view through the roof of the LM. Having lined up in front of the CSM, the commander had to pitch down until the docking apparatus of both spacecraft faced each other, essentially lining up their x axes. The LM was then rotated 60 degrees to line up the docking aids between the two spacecraft. From here, the CMP took over, bringing the spacecraft together and docking. The commander could carry out the docking, but to do so would have meant craning his head backwards uncomfortably. It was much easier for the commander to hold the LM steady while the CMP, who was seated comfortably looking through a rendezvous window, brought the CSM up to the small spacecraft. Docking alignment of the CSM and the LM ascent stage. line up 60 degrees further around before he pitched down, thereby avoiding the Sun. Having done so, Collins asked him to rotate a little further to get the docking aids properly aligned. Unfortunately, holding the LM stable using the AGS had a side effect that caught Collins unaware once he had soft docked and moved to retract the docking probe for a hard dock. As the probe began to pull the light ascent stage towards the much heavier CSM, the AGS detected a change in attitude and furiously tried to compensate for it by firing the LM's thrusters. Collins didn't realise this and began his own attempt to correct the motions of the spacecraft relative to one another, but as the two spacecraft were flexibly joined at the capture latches, their motions were somewhat complex. ''That was a funny one,'' he remarked directly afterwards. ''I thought things were pretty steady. I went to 'retract' there, and that's when all hell broke loose. [The LM was] jerking around quite a bit during the retract cycle.'' In 8 seconds - the time it took the probe to retract - the problem disappeared as the two spacecraft became one. When Eugene Cernan brought Apollo 17's ascent stage, Challenger, to rendezvous with the CSM America he thought the spacecraft was a fine sight to see. "Okay, yaw her around,'' replied Evans as Cernan began to line up the two craft to get the docking aids aligned. "Still looks kind of tinny to me,'' mocked Evans. "Command module looks just as good as the day they put it on the pad,'' said Cernan. "And, you know, so does Challenger, by gosh,'' said Evans. "You're missing some of the pieces.'' The last time he had seen Challenger, it had a descent stage attached, one that still sits quietly on the Moon. Apollo 17's spacecraft station-keeping. CSM America and LM ascent stage Challenger. a bit of getting used to. His approach speed was only 2 or 3 millimetres per second. ''Coming in nice and slow; no problems,'' he informed his commander. ''Stand by,'' warned Evans as the point where 16.3 tonnes of CSM would impact 2.3 tonnes of LM ascent stage whose tanks were nearly empty. However, Evans had brought the CSM in too slowly and the capture latches failed to engage on the inside lip of the drogue. ''Okay. Might have been a little bit slow. Stand by.'' Evans went to have another go but this time, he would drive the probe home by firing his thrusters to give the CSM a positive push in the plus-x direction. ''You got it! Capture!'' Cernan had heard the three latches at the tip of the probe engage. Evans's call for Cernan to 'go Free' meant that he wanted the LM to stop trying to hold its attitude. The lightweight spacecraft was at the end of the probe and any motion it had would be damped out by the probe's articulated tip. ''Crazy thing,'' muttered Evans as he waited for the CSM and LM to line up on the end of the probe. ''I know it. I'm just swinging free,'' replied Cernan. 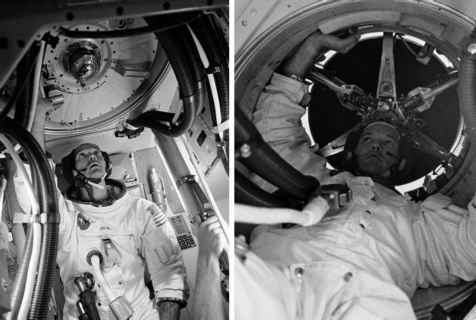 To try to stabilise the situation, Evans suggested that Cernan allow the LM to hold its attitude again. Thruster jets began firing to pull the small spacecraft onto the attitude it had been programmed to keep. As it did so, it also applied a small torque to the CSM through the probe. ''Okay. I'm stable now,'' called Cernan once the LM's motions had damped out. ''We really didn't see any advantage to that LM thrusting,'' added Roosa. ''I didn't like that idea of the LM coming on with thrust. We didn't see where we had anything to lose by trying the normal docking method. If it didn't capture, then we'd try it.'' In the event, Roosa's docking went smoothly, without any hint of the troubles that had beset their earlier docking.